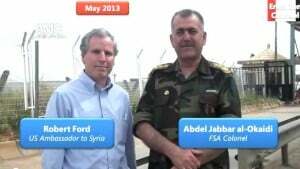 The first photograph is from Spring 2013 and shows Okaidi with the American who has been the principal coordinator of US policy on Syria. The last two photographs are from a meeting days ago when Congressmen Adam Kinzinger (Rep Illinois) and George Holding (Rep. North Carolina) met with Okaidi and other “moderate rebels” in Turkey. Other photos show Okaidi with ISIL fighters and being interviewed about his relationship with ISIL. The photographs are from videos identified at bottom. Photo 2 / August 2013 / Okaidi with ISIL fighters at Menagh Air Base, Syria. ISIL leader is Abu Jandal to Okaidi’s left. Photo 3. / August 2013 / ISIL Leader Abu Jandal at Menagh Air Base, Syria. 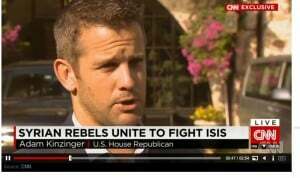 Photo 6 / Sept 24 2014 / Congressman Kinzinger after meeting Okaidi and other “moderate rebels” who the US is arming, supplying and paying salaries. 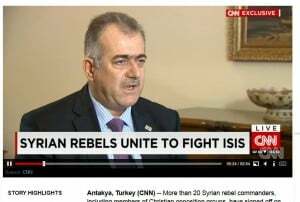 By funding “moderate rebels” like FSA Colonel Okaidi, the US is in effective alliance with ISIL. Under international law it is illegal to encourage, support and aid military and paramilitary activities against another State. Rick Sterling is active with the Syria Solidarity Movement and Mt Diablo Peace and Justice Center. He can be emailed at: [email protected].Read other articles by Rick.